Guatemala has declared a state of emergency due to the ongoing drought, which has caused food shortages and left hundreds of thousands of families at risk of hunger and malnutrition. 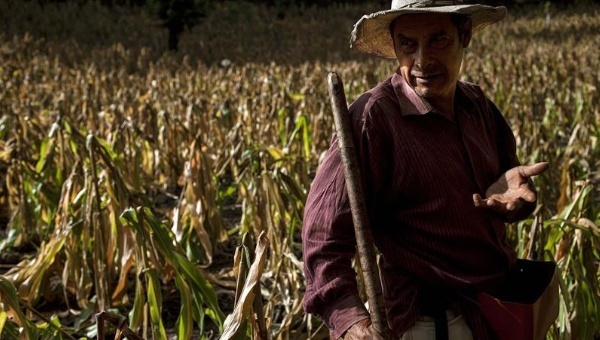 A farmer surveys his dried-out maize crop in Guatemala, which has been hit by a severe drought. Photo courtesy of Infolatam. Whether or not the climatic phenomenon El Niño is to blame for some or all of the various extreme weather events being experienced across Latin America at present, the fact remains that many of the region’s countries from Colombia to Paraguay are under attack from severe extremes of rainfall that are endangering local and national food and water supplies, while exacerbating the vulnerable socioeconomic conditions already in place in many of these areas. Now, months without significant rainfall have led to the government of Guatemala, one of Latin America’s poorest countries, to declare a state of emergency in 16 out of 22 of the country’s states, with the government of President Otto Pérez Molina calling for help from the international community. The lack of rain has meant that as much as 80 or 90% of the country’s corn and bean crops have been lost, with over a million rural and indigenous farmers barely able to feed themselves, let alone produce enough to sell for a living. 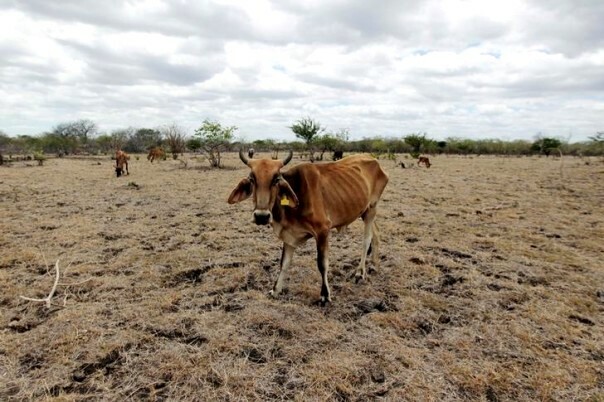 Officials have stated that some 268,000 families have been affected by the drought, which began to intensify at the end of June but which had been preceded by a longer period of below-average rainfall. More than 1.2m subsistence farmers are said to be living through a “human drama”, according to the head of the national Secretariat of Food and National Security (Sesan), Luis Enrique Monterroso, who also said that half a million children under the age of five are at risk of suffering from malnutrition due to the scarcity of available food. Over a million Guatemalans who are either small farmers or their families have already been affected by the drought and resulting food shortages. Photo courtesy of Efe via Telesur. President Pérez Molina has issued a call to all sectors of Guatemalan society to ease the crisis and “ensure that no brother of ours dies of hunger for lack of food”, while defending his decision to declare a state of emergency on August 26th by claiming that the lives of thousands would otherwise be in danger. He also linked the drought to climate change, which he labelled as the responsibility of developed and industrialised countries, lamenting that “countries such as ours are the ones who pay the price”. The government has begun to distribute emergency rations of food to those who are worst affected, but has extended its plea for help to the international community. On August 31st the Vice-President, Roxana Baldetti, revealed that three neighbouring countries – Brazil, Venezuela, and the Dominican Republic – had agreed to offer immediate aid to Guatemala. Mexico, meanwhile, has unveiled a range of technical and material aid for all its Central American neighbours, all of whom have asked Mexico for help in a demonstration of how the drought is by no means restricted to within Guatemala’s borders. 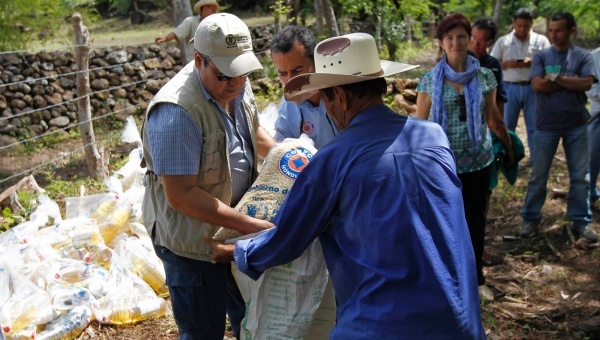 While Guatemala is probably the worst affected of all at the moment, the UN’s World Food Programme (WFP) has suggested that close to 3 million people in total across Central America are facing a serious food crisis because of the drought. Many of the affected are concentrated in the so-called “dry corridor” that runs across southern Guatemala and into El Salvador, Honduras and Nicaragua, with a state of emergency having been declared in Honduras, whose government estimates that 114,000 families are in need of aid and emergency provision of food. The WFP has warned that it does not have anything like enough in the way of emergency food supplies to meet demand, placing even more onus on regional governments who are already struggling to help keep affected families afloat. A farmer receives a bag of provisions from a UN World Food Programme (WFP) worker in Honduras, which has also been badly hit by the drought. Photo courtesy of Reuters. While regional governments scramble to stave off the beginnings of a humanitarian crisis, aid agencies have not been able to remain entirely sympathetic to the plight of Guatemala and other Central American countries. According to a report from the Thomson Reuters Foundation, “years of neglect of agriculture, poor water management and lack of planning to help farmers cope with climate change” are only serving to exacerbate the food shortages and critical conditions in which these countries now find themselves. Successive governments have failed to invest in rural development and the future of the majority of the rural population who are poor farmers dependent on agriculture for their food and livelihoods, Francisco Pavon, a press officer for Oxfam, told Thomson Reuters Foundation. He said that drought and subsequent food shortages are “a disaster that’s been repeated over many years”, and that more needs to be done to implement long-term agricultural policies that help small farmers boost their crop yields and food security, in addition to giving them the tools to resist and adapt to climate change. He also claimed that governments and local farmers should build more wells and other means of storing water, in order to improve locals’ access to water when drought strikes. Meanwhile, the WFP’s regional director for Latin America and the Caribbean, Miguel Barreto, claimed that small farmers are “too dependent” on water-intensive monocultures such as maize and corn, suggesting that producers could branch out to other crops such as mangoes and avocados that would use less water and also help to boost food security. In addition to this, a recent report from another UN body – this time the Food and Agriculture Organisation (FAO) – suggested that better management of food from its production and distribution to the way it is consumed (or not) could theoretically boost nutritional security in Latin America and the Caribbean to the point where hunger and malnutrition could be all but eliminated. Such a possibility should be reflected on even more at a moment where millions more risk going hungry due to the ongoing drought. Cattle, as seen here in Nicaragua, have been dying in their thousands as a result of the scarcity of rainfall. Photo courtesy of Reuters – Oswaldo Rivas. The situation currently playing out in Guatemala and Central America is similar in its outlook to that in Colombia. 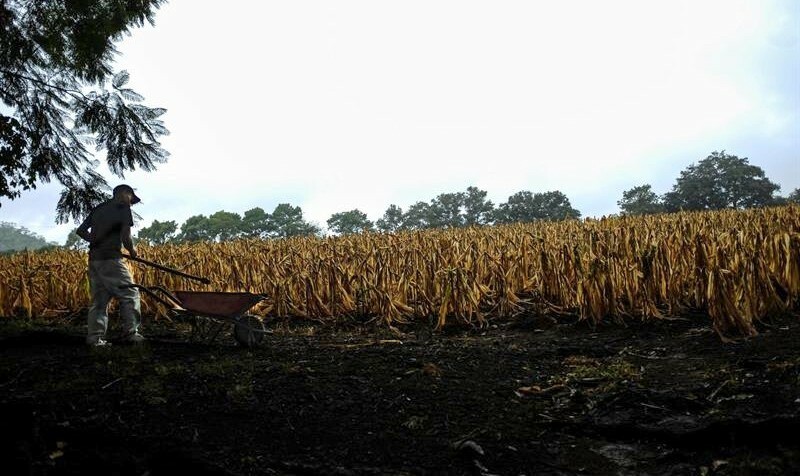 While the long-awaited rainy season is due to get underway from early September onwards, the damage already done to Guatemala’s crops and food supplies is unlikely to be repaired anytime soon. Furthermore, the threat of El Niño means that conditions could deteriorate even further in the short- to medium-term. Finally, though, the warnings from Oxfam, the WFP and others should be taken note of – it is regarded as highly likely that climate change will have a major impact on the parts of Central America currently under siege by drought, and the apparent failings in infrastructure and food security mean that these countries run the risk of being left even more vulnerable to extreme climatic events in the future than they already are.